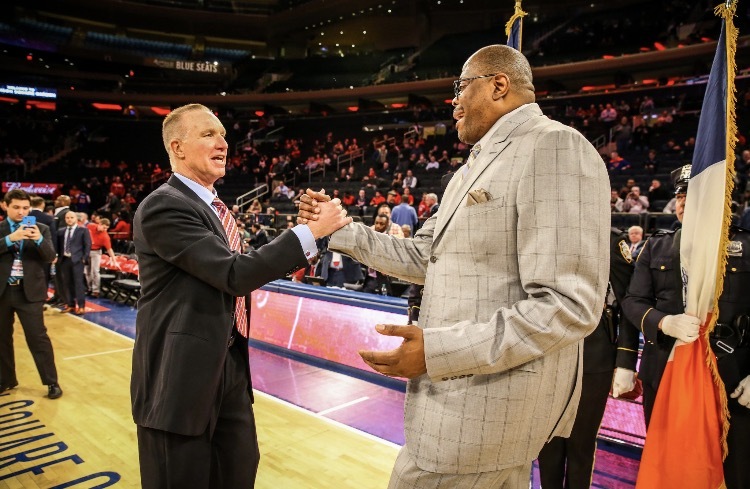 Georgetown outlasted St. John's 69-66 on Tuesday night in a competitive game that was reminiscent of the battles their two coaches, Chris Mullin of St. John's and Patrick Ewing of Georgetown, had in their playing days for their alma maters. For Ewing, it was emotional to get a win at Madison Square Garden after starring here for 15 years for the Knicks. Ewing and Mullin chatted before the game and caught each other's eye throughout the game, including when Ewing started laughing at something Mullin said with a couple minutes left. Ewing was referring to the fact that Marvin Clark II was called for a reach-in foul on Jonathan Mulmore with 10 seconds left and St. John's trailing 67-66 at the time. Mulmore made both free throws to make it a three-point game, 69-66, and St. John's, without a timeout, still had 10.8 seconds to go to the other end and tie the game. Shamorie Ponds got off a good look from the left side with around four seconds left, and Justin Simon got the rebound, dribbled it to the corner, and as he looked for a teammate to pass it to, time expired. This was a back-and-forth game that was tied at 31 at the half, and like most games in this tough stretch for St. John's, they were dominated in the second half. After Marvin Clark II got a layup with 18:03 left to make it 37-35 Red Storm, Georgetown went on a 6-0 run capped by a Jahvon Blair three-pointer to give them a 41-37 edge at the 15:49 mark. It stayed that way for over four minutes, when Simon got a layup at the 11:24 mark, and that ended a nearly seven-minute scoreless streak for St. John's. Georgetown opened up a seven-point lead, 54-47, on a Jagan Mosley layup with 5:02 left, and St. John's responded with a 10-3 run to tie it a 57 on a dunk by Simon at the 3:05 mark that sent the Garden crowd of 9,406 into a frenzy. Even thought Georgetown seemed to take command again with a 5-0 run, St. John's wasn't done, and a Simon layup tied it at 64 with 50 seconds left. On Georgetown's ensuing possession, it was center Jessie Govan who stepped up for their team led by a former 7-foot center who starred for the Knicks. Govan led the way for the Hoyas with 18 points (7-19 shooting), and it was his lone three-pointer of the night from just above the key that gave them a 67-64 lead with 25 seconds left that they would not relinquish. Jessie Govan celebrating his game-winning three. Photo by Jason Schott. St. John's falls to 0-5 in Big East play, 10-7 overall, and it doesn't get any easier as defending Big East champion and 2016 National Champion Villanova pays a visit to The Garden on Saturday night. Georgetown won this game despite shooting just 33.3 percent, or 20-60, from the floor, and committing 22 turnovers. They made up for it with 19 offensive rebounds, compared to just 10 for St. John's. St. John's tough shooting performance continued, as they shot just 23-61, or 37.7 percent, overall. Shamorie Ponds, who has battled injury early in this season and went back to the locker room at one point during this one, shot just 5-15, including 0-3 from behind the arc, and finished with 17 points, along with six assists, four steals, three rebounds, and two turnovers.